Belgium is a small country however one of the most important in Europe. The political center plays a big part in nowadays life. Meanwhile its historic prominence is evident in staggering architecture. We have picked ten great towns, that boast well preserved Gothic, Medieval or later structures. Check out the list! A picturesque town on the coast is a popular holiday resort for the Belgians. The beach boasts a long pier built in 1933, adding an extra charm to the seaside. Meanwhile the smallish, but cozy Old Town will provide with great restaurants that serve delicious fresh sea food. The oldest city in Belgium has experienced tumultuous historic events, ups and downs, nevertheless has always played an important role in the cultural and political life. In fact it is considered to be one of the most important towns in the country regarding the architectural heritage, which unsurprisingly is protected by UNESCO. The city is proud of its incredibly well preserved Medieval architecture. There is a number of civil buildings as well as churches, that had been recognized and protected by UNESCO. Also an abundance of museums will allow to explore Belgian art as well as will give an insight into its history. One of the most prominent cities in Belgium, famous for its art and architecture. During the Renaissance it was a hub of attraction for the painters, printmakers and composers. Today visitors can find original hand-made products such as tapestries, leathers, Mechlin lace, wood carvings, furniture and sculpture. Often referred to as Venice of the North, the beautiful Medieval town boasts canals, allowing visitors to explore it on a romantic boat trip. Among many architectural wonders Bruge feautres the Church of Our Lady, which is one of the tallest brick buildings in the world! The capital of Flemish Brabant hosts the oldest existing Catholic university as well as one of the largest hospitals in Europe, which is related to the university. The city is also proud of numerous architectural buildings as well as its youthful spirit due to a high volume of students, who come to study here from all over the world. Another most populated city after Antwerp and Brussels, Ghent has a famous university and a port, which has made it an important cultural hub for centuries. The city boasts great architecture, museums, restaurants and cultural events. Moreover, there are a few parks, that provide a place to relax. A Walloon city founded on the River Meuse not only is proud of magnificent architecture, but of the landscape as well. The city is built in the backdrop of the precipitous rocky walls. The Citadel of Dinant and the Gothic church are the most precious historic landmarks here. Posited on River Scheldt, Antwerp boasts a port, which is one of the biggest in the world. 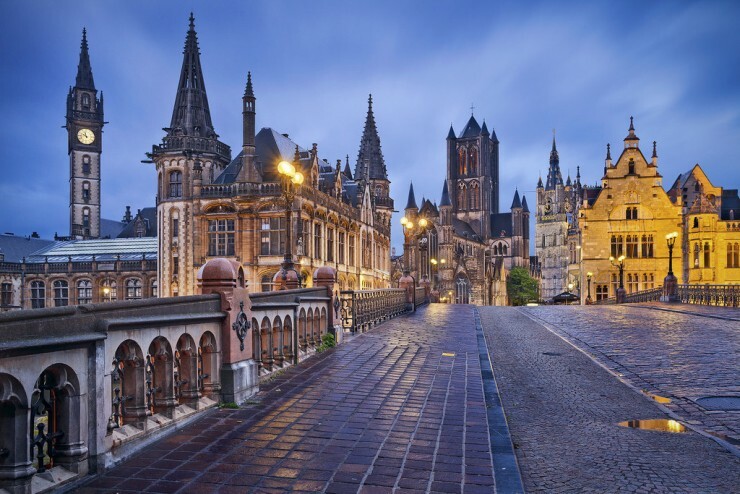 One of the most popular tourist destinations in Belgium, Antwerp features authentic architecture, which very well represents the attention to detail and spirit. It is also an excellent shopping destination! The center of Europe boasts a plethora of landmarks. A designated World Heritage Site by UNESCO, the Grand Place is the most recognizable feature in the capital. The Museum of Brussels, the Town Hall and guildhalls circle the square, allowing to admire the impeccable details of Gothic architecture. Also the capital offers various cultural events all year round!